The Practitioner of Change™ program centers around 5 core sessions, each consisting of 3 days. 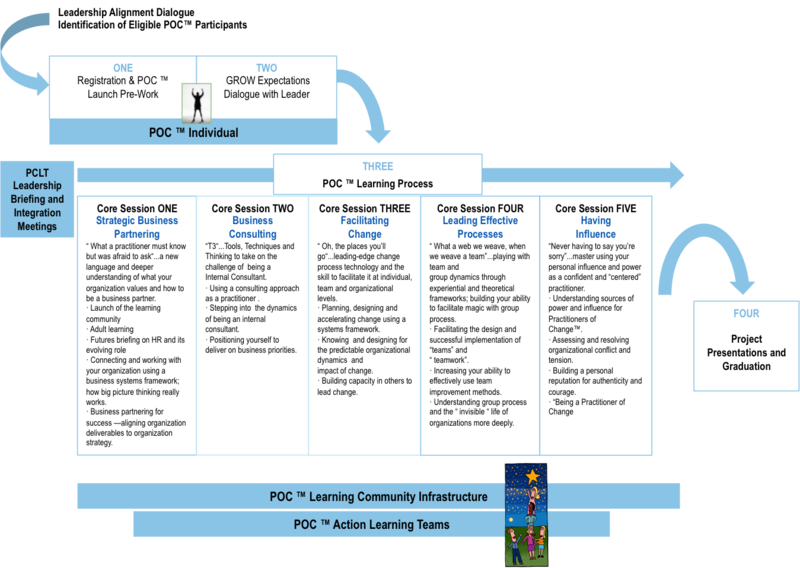 The image & information below is a brief description of the high level learning outcomes for each session POC™ Core Session. The design is integrated, with each core session building off the previous. Launch the formal Practitioner of Change™ learning process and form the learning community. Increase your knowledge of adult learning styles and your personal approach to learning. Understand how future trends and issues shape the roles in our functions. Learn a pragmatic approach to functional systems thinking. Use and apply business knowledge to better position your function to deliver upon business priorities. Explore and know how to address the challenges of being an internal business partner. Build deeper practical skill in the area of organization development and the role of the OD practitioner. Learn and practice a business consulting process using a progressive case study. Progress your skill in each area of the business consulting process including contracting for success; gathering, analyzing and feeding back organization data; diagnosing, designing and implementing appropriate responses; evaluating the impact of your work; and, ending a consulting contract. Learn how to leverage your personal style to work effectively as an internal consultant and leverage your Business Partnering skills. Learn how to view change through a systems thinking lens to understand why change efforts succeed. Explore various change theories and methods to understand and influence the design and implementation of change. Plan, design and facilitate change using a change systems framework. Know how to build the context for change, design and create a disciplined and systematic change process and how to guide the implementation. Increase your ability to influence others regarding effective and ineffective change processes. Prepare leaders to lead change in your organization. Define the requirements of a team-based organization; what’s required and how to evaluate the fit. Know when and how to design a team based structure and facilitate the design of high performance teams. Learn the content and process roles of practitioners when working with teams. Designing and facilitating effective group and team processes. Identifying the invisible dynamics of groups and teams. Developing process consulting and task facilitation skills and the role of the practitioner. How to influence team effectiveness. Review your action learning team performance to date. Enhance your self-confidence through increased self-awareness of your personal presence. Relate sources of personal power and influence and emotional intelligence to Practitioner success. Learn how to provocatively model your authenticity and courage as a practitioner. Strengthen your ability to work with tension, in yourself and with others. Be present and accountable as a Practitioner of Change™; integrating what you know with who you are. Formally close the learning community structure. As a learning system, participants have a first hand opportunity to examine and explore organizational dynamics as they are learning about them conceptually. Our philosophy is “you can’t take an individual, group or an organization to a place you haven’t been” so we design the learning process to ensure that practitioners have first hand and deep experience with the impact of processes to influence organization effectiveness. Copyright © 2018 Converge Consulting Group Inc.